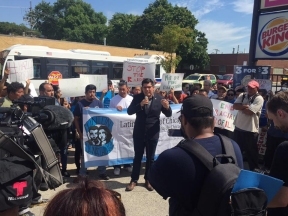 A huge rally took over the parking lot of a Shell Gas station on the north side Tuesday afternoon to denounce ICE’s civil rights violations affecting labor workers. On the corner of Milwaukee and Belmont, organizers from Latino Union of Chicago, Organized Communities Against Deportations, #Not1More Campaign, along with day laborers held a press conference to address agents from Immigration and Customs Enforcement (ICE) racial profiling tactics, which recently affected day laborers awaiting work on the corner of Milwaukee and Belmont, calling upon a an official investigation. “ICE agents suddenly just appeared. We thought they were employers coming to pick us up for work, but instead it was ICE demanding to see our papers and scanning our hands,” said day laborer William Rivero. “We are just workers –why do they come to violate our basic rights?” At the press conference, workers share with the media that agents demanded some of the workers on the corner submit to having their hands scanned without cause. 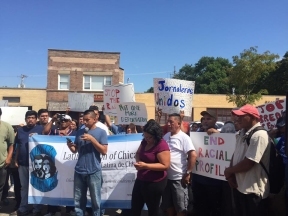 “We want to tell the city of Chicago, that this is just another reason why they need to break all collaborations with immigration, no exceptions,” said Anibal, member of Organized Communities Against Deportations.